The complete singles and demos recorded by Fur-lined, who shone briefly in London in the early nineties. The line-up was South African Dale Olivier on vocals; Jon Tregenna on guitar and Ian Mansel-Thomas on bass (both from Llanelli) and Gloucester's Laurence Ash on drums. Formed in 1993 they achieved modest success with their debut 3-track EP, Love Is Dead but it didn't really lead anywhere. A 2nd 7" vinyl single (Kitchen Party) followed, again on their own Great Art record label. Radio plays came from Radio 1's John Peel, Steve Lamacq and Jo Wiley, Mark Goodyear (on drivetime) and Gary Crowley on GLR was a big fan. After ditching their 70s suits, long hair and elaborate literary dubby guitar rock in favour of a more unambitious Brit-pop look and sound, they split up in 1994 after recording a song called Gladiator. Dale went on to record solo albums and run Matchbox Recordings, Ian joined art-rockers Fraff and lives in Colchester, and Jon returned to Wales where he still records music as The Mams. Laurence lives in Gloucester and is the drummer in Cold Hard Facts. Cwestiwn Da were from Llanelli. They were a Welsh post-punk band with Jon Tregenna on guitar and vocals, Geraint Thomas on Bass and Jonathan Gimblett in drums. Jonathan was replaced by Rowan Griffiths because he had to sit his O-levels. Cwestiwn Da appeared regularly in Welsh TV shows like Ser and Roc Rol Te. They gigged across Wales, supporting Y Brodyr and Maffia Mr Huws, and also played at the first Pesda Roc. They recorded sessions for the BBC, but released only one track on vinyl. 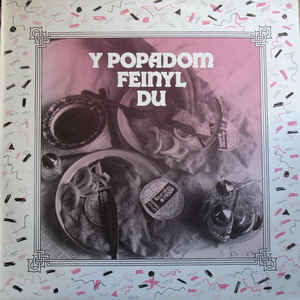 Ail-Gwrdda was part of the heralded Y Popadom Feinyl Du EP and can be heard here.